Receding gums is a sign of a gum and bone infection. Inflammation and loss of gum tissue will expose root surfaces. The condition is also associated with bone and tooth loss. Dental X-ray is needed for decision making and to examine for further bone loss beneath the surface. Gum recession of the upper and lower premolars & molars. Gum recession and root exposure. Treatment may include root planning, antibiotic implants, bone grafting or extraction therapy. Pre and post cleaning photographs will be shared to illustrate treatment and to develop an oral health plan. 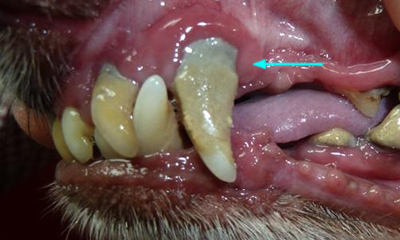 Schedule an appointment today to have your pet evaluated for gum hyperplasia. Gum recession is the result of bacterial infection and destruction of gum tissue. There is an associated loss of bone and exposure of the root surface. 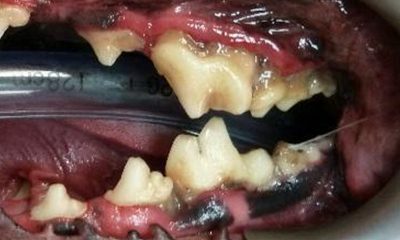 Dental X-rays and probing will reveal more bone loss that is visible and many of these teeth and adjacent teeth will be extracted. Dental X-rays and probing are used to evaluate the extent of the bone loss. A treatment plan is developed and may include: root planning, antibiotic implants, bone grafting or extraction therapy. When extractions are performed, a surgical technique is utilized to minimize pain, prevent root fracture or complications and attain optimal healing. Pre and post cleaning photographs will be shared to illustrate treatment and to develop an oral health plan.